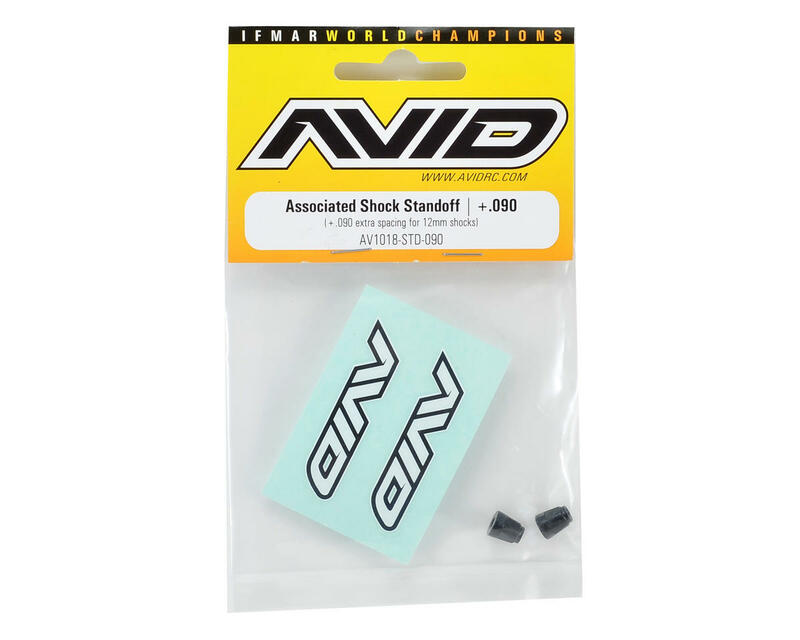 This is an optional Avid RC +.090 Standard Shock Standoff Set, and is intended for use with Team Associated 1/10 scale vehicles. The Avid Standard +.090 Standoff for Associated vehicles is is only for racers upgrading older model cars from V2 shocks to larger 12mm big-bore shocks. Used on a B44.1 front and rear and a B4.1 front to avoid trimming the front shock tower. Avid has designed strong standoffs with replaceable Delrin pivot bushings to coincide with the release of the 12mm Team Associated big-bore shocks. The standard +.090 aluminum shock standoffs are made of black anodized 7075 Aluminum and have a wide base to prevent bent shock mount screws from de-railing your bid for TQ. The Delrin pivot bushings can be replaced to help keep a tight fit and not wear out your aluminum shock caps. Avid Standard +.090 Standoff for Associated vehicles is only for racers upgrading older model cars from V2 shocks to larger 12mm big-bore shocks. Used on a B44.1 front and rear and a B4.1 front to avoid trimming the front shock tower. Wide base and extended standoff prevents mount screws from bending easily. 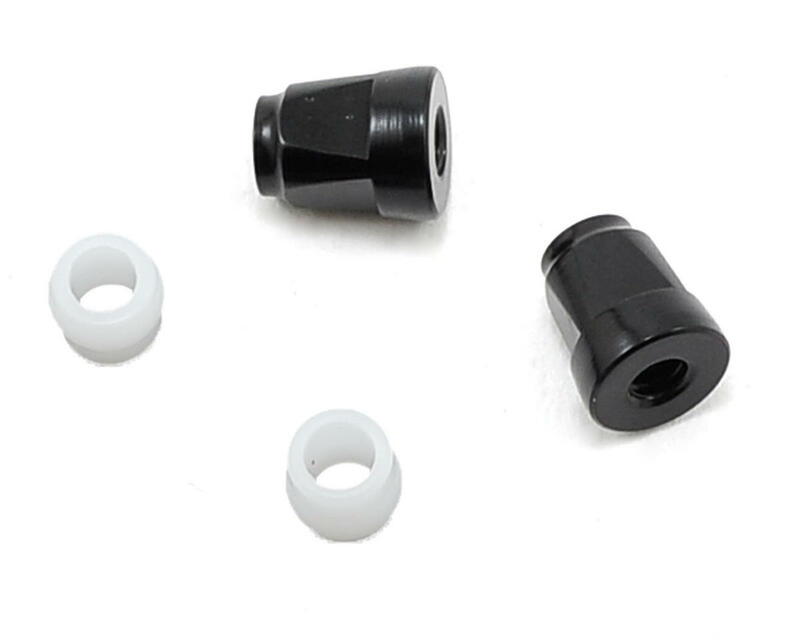 Delrin™ bushings are replaceable for low friction, low slop. No metal-on-metal contact. Each package includes 2 short standoffs, 2 Delrin bushings, and 1 AVID mini decal sheet. What Size Standoff Do I Need? Associated Short Shock Standoff (AVD1018-SHORT): This is a direct upgrade for the ASC1781 Associated Short Bushing. It is used on the rear of a B4.2, T4.2, and SC10. Associated Standard Shock Standoff (AVD1018-STD): This is a direct upgrade for the ASC1780 Associated Bushing. It is used on the front of a B4.2, T4.1, and SC10 as well as all 4 locations on a B44.2 and B44.1. For racers upgrading an older model car from V2 to 12mm big-bore shocks, this length goes on the rear shock tower of a B4.1, T4.1, and SC10 to avoid trimming the rear shock tower. Associated +.030 Shock Standoff (AVD1018-STD-030): This is only for racers upgrading older model cars from V2 shocks to larger 12mm big-bore shocks. It is commonly used on the front of a B4.1*, T4.1, and SC10 for those running 12mm shocks. *minor trimming required to clear spring adjustment collar. Associated +.090 Shock Standoff (AVD1018-STD-090): This is only for racers upgrading older model cars from V2 shocks to larger 12mm big-bore shocks. Used on a B44.1 front and rear and a B4.1 front to avoid trimming the front shock tower.